PCE counting scales can be used in several different fields as some can measure in milligrams and others in tons. The counting scales can, for instance, be used in industry and commerce or for professional weighing and piece counting and serve either as quantity scales, reference scales or as verifiable industrial scales for professional use and meet all the quality requirements of modern scales. Typical areas of application are incoming goods, production, development and sales. PCE counting scales normally have a certain storage capacity, which makes them an irreplaceable tool for professional use. They are the ideal tool for determining the amount of pieces with high accuracy, i. e. for inventory activities, for example for counting small objects like screws, washers, etc. How counting scales work: For the piece counting function, it is necessary to determine the real weight of one piece. Depending on the model, the piece weight can be entered by weighing the piece or entering the value via the keypad. The weight which is placed on the weighing platform is divided through the previously set piece weight. However, slight deviations in the piece weight can sum up to incorrect results. By means of reference updating, the average value of the piece weight can be adjusted to improve the result. There are counting scales that can display the total weight, the piece weight and the calculated quantity at the same time. Although inventory scales have been optimised for counting, this does not mean that they are inferior to other scales when it comes to their other functions. The counting scales consist of many different components, which have corresponding official certificates. Any PCE counting scales are supplied in calibrated condition and, if required, verifiable models can be verified by us or on our behalf. Counting scales must be verified, for example, when they are used for packaging. In order to abide to the law, official verification is compulsory. Therefore, our inventory scales are verified. We can also take care of re-calibrations and installation. In most cases, counting scales can be powered by a 240 V mains adaptor or battery operated. Battery-powered counting scales work independently from where they are placed and thus enable mobile use. PCE always offers some optional equipment along with their counting scales such as an ISO certificate. Counting scales should be chosen according to the minimum weight of the piece for the piece counting function. In order to choose the appropriate counting scales, it is important to bear in mind that counting scales with an internal resolution of only 10 grams cannot weigh pieces of 0.1 grams. PCE-PB 60N is a multipurpose industrial Counting Scales with ZERO, TARE and part counting (PCS) functionality. This heavy-duty digital balance features a removable stainless steel pan for easy cleaning. The scale weighs units in either grams (g), kilograms (kg), pounds (lb) or Newtons (N), and is powered by battery or AC power. Ideal for shipping, receiving, manufacturing and general purpose use, this versatile scale has a large LCD for easy viewing, simple 4-button operation and a USB interface for connecting to a PC. The Counting Scale PCE-BS 3000 is a light, rugged precision balance suitable for different purposes. The removable stainless steel pan allows the laboratory balance to be cleaned easily. The Counting Scale PCE-BS 3000 can be used for weighing as well as for piece counting. The Counting Scale PCE-BS 300 is a light, rugged precision balance suitable for different purposes. The removable stainless steel pan allows the laboratory balance to be cleaned easily. The Counting Scale PCE-BS 300 can be used for weighing as well as for piece counting. The robust counting scales is a real all-rounder. The stand of the counting scales can be easily separated along with the tripod mount from the platform and possibly sunk into the workbench. The cable between the platform and the display has a plug attached and is about 1.6 m long. KB 1200-2N is a digital laboratory balance or counting scale offering a high level of precision as well as features such as percentage determination, GLP record keeping, recipe, piece counting, pre-tare, suspended weighing (hook not included) and vibration-free animal weighing functions. Complete with freely programmable weighing units (e.g., direct display of thread length (g/m), paper weight (g/m2), etc. ), this laboratory balance supports a wide range of applications in pharmaceutical, dental, food, veterinary, jewelry, textile and printing industries and beyond. 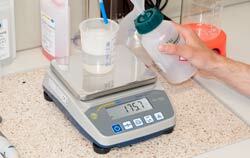 Counting Scales PCE-BT 200 to be used in Laboratories, production, quality controls, etc. Some important aspects are both their design consisting on a flat surface and also they are very easy to use. The small size together with their high resolution in wider weighing ranges are other advantages of the PCE-BT 200. Counting Scales PCE-BT 2000 to be used in Laboratories, production, quality controls, etc. Some important aspects of this device are both their design consisting on a flat surface and also they are very easy to use. The small size together with their high resolution in wider weighing ranges are other advantages of the Counting Scales PCE-BT 2000. The counting scales PCE-SD 30C are low-cost robust verifiable system balances. The calibration of the counting scales is according to the trading class M III. The sturdy foundation of the counting scales is made of painted steel and features a plastic-coated steel platform. The counting scales PCE-SD 60C are low-cost robust verifiable system balances. The calibration of the scales is according to the trading class M III. The sturdy foundation is made of painted steel and features a plastic-coated steel platform. The counting scales PCE-SD 150C are low-cost robust verifiable system balances. The calibration is according to the trading class M III. The sturdy foundation of the counting scales is made of painted steel and features a plastic-coated steel platform. The counting scales PCE-SD 300C are low-cost robust verifiable system balances. The calibration is according to the trading class M III. The sturdy foundation of the counting scales is made of painted steel and features a plastic-coated steel platform. Verifiable waterproof counting scales in stainless steel with separate indicator (no corrosion). The counting scales are manufactured to IP67, dust-tight and thus can also be temporarily submerged completely under water (up to 1 m depth). The main task of the counting scales is the piece number determination with the help of the weight measurement. So, it means that if there are 10 pieces on the scales and the total weight is 20 g, then the piece weight is 2 g. As a result, if the total weight is 200 g, there must be 100 pieces on the scales. The determination of the number of pieces is based on the rule of three, whereby the counting scales always require the piece weight for the counting. The transmission of the piece weight to the counting scales is the biggest difference between the individual counting scales and should be adapted to the task field. In the simple models of counting scales, the counting function is a just one of many and not the main feature of these scales. The piece weight can only be determined by the scales with the help of the reference piece numbers. These counting scales look like regular scales and may not be recognized as counting scales at the first glance. - The user places 10 pieces on the scales. - In the counting function, the user is given the reference piece numbers of e.g. 5/10/20/50/100 etc., which the user has to confirm then. In this example, there are 10 parts. - Since the scales know the total weight and the number of pieces, the piece weight can be determined by the balance itself. This type of the counting scales requires, before each article change, the count of a reference piece number as well as the procedure described above. It should be taken into consideration that not every part has exactly the same weight. Therefore, there may be total miscounts due to the weight tolerances of the individual parts. In order to avoid these miscounts, the largest possible number of reference pieces should be used, especially for light parts, in order to obtain a representative average piece weight. So, if several products are counted but they are frequently changed, the counting with these counting scales is impractical. In this case, the counting scales with the piece counting function as their main task should be used. This type of scales differs significantly from regular scales. This type of the counting scales offers the user three displays with different information. Thus, all the parameters – total weight, the piece weight and the number of pieces – are visible at a glance. In the first step, the user must set the piece weight in the scales. 1. With the help of the reference quantity. The user places e.g. 18 pieces on the scales, press the reference piece number key and enters the number 18 using the input keys. 2. Direct input of the piece weight. If the piece weights have already been determined (see above "average piece weight"), this weight can be entered directly with the help of the number keys. If several batches of a product are counted, a total number of pieces can be determined by summing the individual counts. Since the pieces to be counted are usually stored and transported in an overpackaging, the net weights must be determined for the counts. The net weight is therefore the pure weight of the pieces to be counted without the packaging. 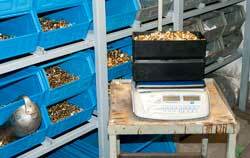 The counting scales offer the possibility of entering the tare weight of the packaging using the number keys. In this case, unpackaging of the parts to be counted is not necessary anymore, if the tare weight is known. Another interesting function regarding piece counting is the entering of the target quantity. After the registered number of pieces has been reached, an acoustic signal is given. But even in case of these types of scales there are differences. The differences are determined and characterized by the extent of the individual functions. In the simpler counting scales, the input of data such as e.g. piece weight / tare weight / target piece number is carried out by the user. In the more complicated models of the counting scales it is possible to create databases which the user can access. This can be possibly done by scanning the item number. Another possibility is the communication of the counting scales with an inventory management system, where the required data can be retrieved and also the data can be stored after a finished counting. Therefore, it is very important to clarify in advance how the working process with the counting scales should be arranged in order to carry out the time-consuming counting successfully and efficiently. After the type of scales has been selected, a suitable measuring range must be specified. In general, a compromise has to be made between high resolution and high measuring range. Thus, scales with a higher, maximum weighing range have a lower resolution compared to the scales with a smaller weighing range. Therefore, before purchasing a counting scale, the lightest piece to be counted must be determined. This piece weight should not be below the resolution of the counting scales, in order to allow a reliable measurement. Example: If the lightest piece to be counted is 0.2 g, then the scales with min. 0.2g resolution should be used. Based on this piece weight, the resolution of the scales can be determined, and there are different weighing ranges depending on the price range. Finally, it should be considered what further steps after the count should be taken. Is it sufficient if the number of pieces only appears on the display of the counting scales or should the number of pieces with the indication of the article number be printed on adhesive labels or, if necessary, stored? These possibilities of data processing differ from one model of the counting scales to another and should be considered, before making the choice.